There has been a fair amount of media recently about the problem of pigeons in capital cities of Australia. Each city has come up with a different plan on how to manage the problem. However, there is a solution that can be very effective to keep birds out of roofs and ceilings on commercial building and car parks. This involves Bird Proofing your building so that birds have nowhere to go. To find out more about bird proof netting contact Bird Proofing Australia. Bird Proof Netting is a permanent solution to bird problems in commercial buildings. Read on to see the comparison and advantages and disadvantages of each type of bird control. According to an interesting article in The Monthly (The Monthly Article) written by John Harms, Perth has a $1,000 fine for feeding pigeons, Brisbane has hired a “falconer” Paul Mander to scare the pigeons away and Adelaide have drugged their pigeons by adding an hallucinogenic drug to bird seed the council put around. Apparently the birds just “fly off” and don’t come back….mmmmm…interesting. Melbourne has even hired a “pigeon expert”, Guy Merchant, director of The Pigeon Control Advisory Service in England and hired by the City of Melbourne to deal with the CBD’s 40,000 to 60,000 pigeons. It turns out that Guy is a pigeon enthusiast and said that the city of Melbourne has a people problem, not a pigeon problem. That they simply have to stop feeding the birds and they won’t stay. So, the council put up signs and a fine if you are caught feeding the pigeons. I actually do think Guy might be right. That as humans we are to blame for this problem. The amount of food found naturally from the ocean has been depleted over the years. Their natural habitat has been taken over by development. The amount of waste disposal centers has increased as we dump our rubbish and if I was a bird, I’d be going for the easiest option to – hanging out where the people are and eating what I could find lying around. It is only logical that we are now having to deal with the bird problem. 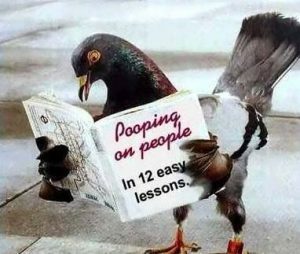 The ABC has reported that the township of Young in NSW is plagued with pigeons (ABC Article Young) “Residents have been complaining about the faeces on the facades of buildings in the central business district” according to the article. So the township of Young would seem to have the following options: Imposing a fine stopping people from feeding birds, hiring a falconer to scare the birds away, providing a free trip to Australia for a “Pigeon expert” for advice or drugging the pigeons. It would appear that possibly bird proofing buildings where possible may be the only solution or simply enjoying the company of a few thousand birds to the township. “To net or not to net”…that is the question, right? When you’ve got a bird or pigeon problem in the roof, or car park basement of your building what do you do? How are you going to stop the birds from building their nests in the purlin’s and rafters? When looking into this problem ourselves when researching the business we came up with the following options. This might be helpful for you when putting together a business case for bird proofing. Possibly illegal depending on the species of bird and your state/national law. Good for situations where attaching netting to the structure is difficult or impossible. Birds can adapt to the sound and come back after a period of time. Ideal for light posts/structures that stand alone on a small surface area. For large areas (e.g. commercial premises) a large number of spikes would be required costing a lot of money to install and not as effective as netting (too many alternative nesting options). There is no technology, chemicals, ugly erections or ongoing maintenance required. So, as you can see by the list, it’s easy to understand why Bird Proofing Australia specialises in Bird Proof Netting as a permanent solution to bird and pigeon pest control problems in commercial buildings. Call us today on Ph:1300 136 125 or email us to discuss your pigeon problems with the team and obtain a free quote for your bird netting solution.